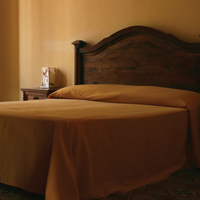 B&B Ai Lumi is settled in a magnificient Barocque Building in the Monumental part of the town. It has 4 comfortable rooms facing the ancient courtyard. In the higher levels there are the apartments, some of them facing the main road. Rooms are fully equipped and aprtments kitchenette are fully accessorised. It is a simple but elegant style. Daily cleaning and lining change. But the cuep-de-cuer is the wonderful buffet continental breakfast with many homemade products and the best cappuccino in town. In summer beside it can be tasted in the terrace with a lady offering turistic informations. Wi-fi throughout the whole building. There is no private parking nor elevator. Riccardo and Francesca speak fluent English, German and French.